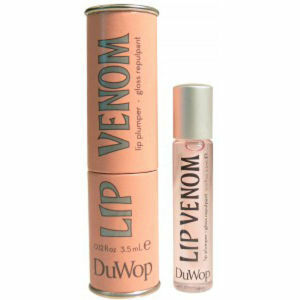 DuWop Moon Venom makes your lips twinkle in the twilight. With all the pout perfecting power of the original Lip Venom, this version of the classic gloss shines with opal tones. A creamy dazzler that will leave lips shining like the stars! Blood rushes to the surface as the blend of essential oils work their magic. Cinnamon, ginger, jojoba & creamy avocado oils help to create the tingle & provide your lips with a chic sheen. Ultra light in texture & appearance, with not the slightest hint of “jam-jar stickiness”, DuWop's Moon Venom has a milky richness that allows you to glam-up day or night with pearly shimmer. A fantastic twist on an old favourite. Don't miss out on this lip plumper that will have you dancing in the moonlight, and outshining the others to boot! Celebrity fans of the Venom line include Lindsay Lohan, Jennifer Aniston, Teri Hatcher, and Sienna Miller. Fatten up even the thinnest lip-line with this easy-to-apply gloss. Sweep over the entire top lip with a firm, confident stroke & dot over the lower lip, concentrating on the centre for maximum pout power! When this arrived I went upstairs exfoliated my lips first and when I came down my daughter in law said immediately wow have you just used that new plumper your lips look really pouty! I love it! It has a subtle shimmer and the tingle is nice and subtle (not uncomfortable at all). I will be trying the whole Duwop range but think the lovely shimmer in this will be hard to beat. My daughter in law has just ordered herself some.